Topsy Turvy Table Runner—Sew Easy! Riley Blake Designs sent me a collection of grey and white prints that really caught my eye. Teaming them with a lime-colored solid, I knew a table runner was soon to be created. The design I chose is a nontraditional Dresden plate. No round shapes here—the wedge-shapes of the Dresden are stitched, well topsy-turvy, to create a linear look. This finished table runner is approximately 18″ x 86″. You could shorten or lengthen depending upon your table size. Eight (8) coordinating fat quarters. Featured collection is the Basic Variety Fat Quarter Pack in Grey from Riley Blake Designs. 1 yard of solid-colored cotton fabric for sashing strips and binding. Featured fabric is a Cotton Solid in Lime from Riley Blake Designs. Clover’s Trace ‘n Create Quilt Templates—Dresden Collection (only the wedge shape, template A) will be used. Twenty-four 18-1/4″ long wedges are needed for this project. Select eight coordinating fat quarters. Press fat quarters. Note from Nancy: The instructions reference using fat quarters (18″ x 22″ cuts.) In lieu of using fat quarters, you could also cut wedges from standard yardage. Cut 18-1/4″ crosswise strips of coordinating fabrics. Consider using four coordinates, rather than eight, to save on yardage. Position Template A on the wrong side of a fat quarter. Align the template at a corner and along one straight edge. Trace along both sides of the template. Rotate the template 180-degrees. Align one edge of the template with the previously traced mark, trace along the opposite side of the template. Rotate the template a second time. Again, align one edge of the template with the previously traced mark; trace along the opposite side of the template. 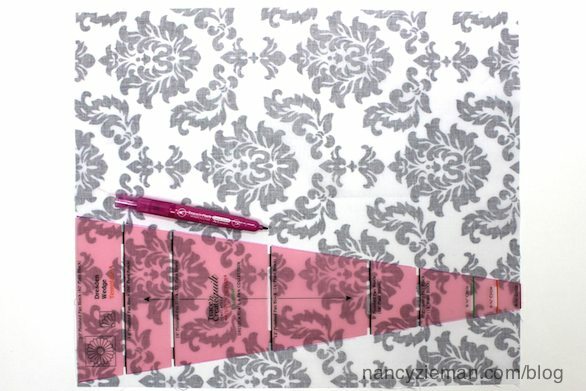 Note from Nancy: Stack 3–4 fat quarter sections together to save time tracing the wedge shapes on each fat quarter. Cut 12, 3/4″ crosswise strips from the solid fabric to use as sashing. Cut seven 2-1/2″ crosswise strips to use as binding; set these strips aside. Seam the sashing strips. Align right sides, cross the ends creating a 90-degree angle, and stitch across the fabric strips as pictured. Trim the seam allowances to 1/4″ and press. Align the first wedge to the sashing strip, right sides together, with the narrow end at the top of the sashing strip. Stitch with a 1/4″ seam allowance. Notice that the wide end of the wedge is at the end of the sashing strip. Place a second wedge on the sashing strip, wide end first, leaving 1″ between the wedges. Stitch the second wedge to the sashing strip. Continue adding wedge shapes to the sashing strips, alternating the wedges and again, leaving 1″ between the wedges. Position the wedges on the strip with the wide end of the wedge following a wide end or a narrow end of the wedge following a narrow end. 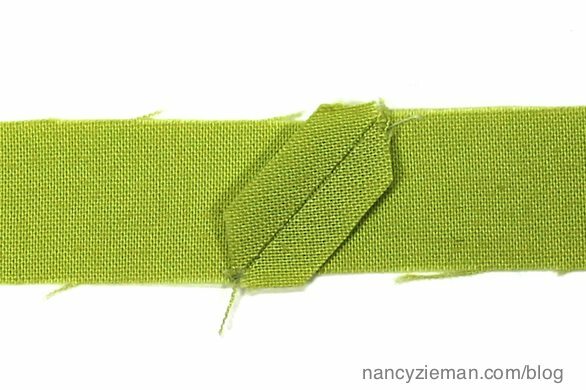 Note From Nancy: In order for the wedges to be sewn together in the topsy-turvy manner, half the wedges will have sashing on the left side and the other half will have the sashing sewn to the right side. That’s the reason for alternating the position of the wedges on the sashing strips. Separate the wedges, cutting between the 1″ space. Press the seam allowances toward the wedges. Align the ruler along the cut edge of the narrow end of the wedge, trim off the excess sashing. Repeat on the wide end. Determine the layout of the wedges, alternating the wedges in the topsy-turvy layout! Note from Nancy: Learn from my mistake! My staff and I didn’t alternate the positioning and stitching of the wedges on the sashing strips. Half of the sashing strips had to be removed and restitched. Oops! That’s why this photo shows some of the wedges without sashing strip. Pin and stitch the wedges together, using a 1/4″ seam allowance. Straighten the narrow ends of the table runner. Place a pin at the center of the end wedges. Measure 1/4″ from the pin to add a seam allowance. Extend the seam allowance the length of the wedge. Cut along the seam allowance mark, trimming off the excess fabric. Back the table runner with batting and a backing fabric. Pin the layers together using safety pins. Straight stitch the layers together. Stitch, guiding the edge of the presser foot along the sashing seam. Repeat stitching on each side of all the sashing strips. Bind the table runner, using your favorite technique. Click here for binding instructions. The feature photo and photo below was taken at Birch Haven, a center that offers a unique and quiet atmosphere to relax and enjoy your favorite craft or hobby. There are beautiful rooms, creative center, superb kitchen, and relaxing outdoor area. Thank you Susie for the use of your facility. Click here to create another table runner, using the same template. This is such a versatile template! This is really good. Reminds me of your version. I am going to love making a topsy turvy table runner. That’s more or less the missing piece of the puzzle! We can manufacture Roof lights in different size to accomplish your building project. a practicable concept. As such, if the principal interest is good for the surroundings, a brilliant meter might not exactly provide way too many benefits. Your table runner looks like a great project. My comment is more about a sewing tip I have. I don’t know if you have had this tip, but when I make small applique projects, instead of using traditional interfacing materials, I like to use, used dryer sheets. I feel it adds the same affect that interfacing gives. I hope this is a good tip to share. I’ve been wanting to make this sewing tip known to you, but wasn’t sure how I could do that. Thank you for this forum to tell you. I would love to create the same table runner. I think the grey and lime green were a perfect match to my contemporary designs. Love it! I would love to make a quilt for a grandson using the template. I have many fabrics to use and the pattern gives me visions of windmills! No more running to the copy shop to enlarge or decrease the size! Love you programs and blogs and your “corner” for humanity. I think I would make this table runner but with hot pink accents instead, and use it in the living room to add a pop of unexpected color without being in your face. Thanks for the fab tutorial! I LOVE the Topsy Turvey table runner. I’d love a long one for our Thanksgiving table. I think I’ll make it with a fall palette! Oh I love these templates and fabrics to make original table runners for christmas ! Since I already have your Dresden template, I would try making the tipsy-turvy table runner you featured using the Riley Blake fabrics. Thanks for more great ideas. Very much enjoying your blog as I have your wonderful program for many years now. It has truly enabled me to take risks and try new things such as machine embroidery and now quilting which I am still a beginner at, but just love this runner and should received my template soon. I am doing it in an assortment of black and white fabrics with a red binding as these are the colours in my home. If it works out well, I see co-ordinated table runners in the future as Christmas gifts for friends and family. Thanks again for being one of my favourite mentors. I have been wanting a template like this for months. I would do what you did maybe in Christmas colors, or if I won the fat quarters would be very happy with that. I think it would be interesting I. A bag! These Riley Blake fabrics are perfect and I would love to make a lapquilt for my living room – it is gorgeous. The table runner with the grey fabrics and lime green sashing is beautiful and I would really like to make that for my dining room. Love Riley Blake fabric. 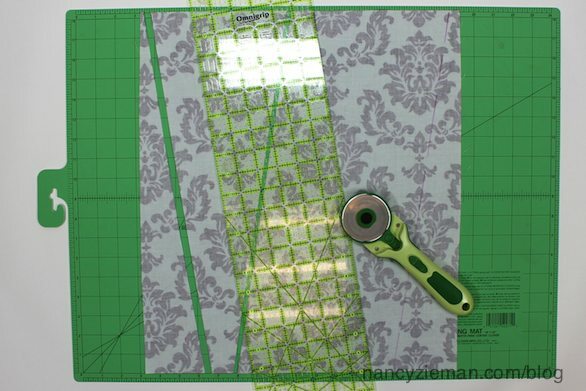 If I won the Trance N’ Create Quilt Template Dresden Collection I would make the Topsy Turvy Table Runner by Nancy Zieman first and then many other items. Thanks for the giveaway! I love the table runner you made with the grey and white fat quarters and would love to make one just like it if I am the winner. Of course, I would need to purchase the dresden template also. Thanks for a great tutorial and giveaway! I took scrap and I am making the table runner you have pictured. Love the grays but I used in colors. anyway I would love a change to win and thank you for all that you do. Clover’s templates are fantastic, but I don’t have this one yet. It never occurred to me that this particular template could be used to make this modern triangular style quilt. My nieces too would love this contemporary and fun table runner & placemats or even a quilt. Thanks Nancy’s Notions for the inspiring examples! I would pair these gorgeous contemporary gray/taupe patterns with a rich aqua and black and make Nancy’s table runner for my 10′ long buffet. I’d make the same tablerunner with the fabric, and with the templates too! I love the gray with the pop of color! The Riley Blake Collection would be used to make matching placemats, hot pads, and mitts for my daughters new kitchen. She just had her kitchen cabinets refinished – grey! These fabrics would be perfect! Have wanted to get Nancy’s Dresden Template for a while now but haven’t had the chance yet. My stash has been waiting for me to make a bed runner using it. I love creating home dec items and used the Riley Blake fabric to make the eye glasses pillows. Would love to try this table runner to help get me started on quilting skills. I would use this to make a table runner for my five sisters for Christmas. I can’t wait to see their faces! I have 3 Trace and Create bag template packs and love them! They are so easy to use! Thank you for making sewing less complicated and more fun! I haven’t started to quilt yet, but this would be a great way to start! I like the contemporary design! Thank you for making learning to sew fun and easy! Love the gray fabrics! What a wonderful and different table runner. Would look great in my kitchen! I am a terminally ill cancer patient who can still sit at my sewing machine and make lap quilts for patients at the Rehab Center. The Trace ‘n Create Quilt Template— Dresden Collection and the fabric would help to make a beautiful lap quilt gift for a patient. I would make a mini Christmas tree skirt using the Dresden Templates – my poor mini tree has been “skirtless” for years. I would love to make a totebag with these fabrics; I’d stick with the apple green for an accent. The Basic Grey Fat Quarter Pack is a great contemporary look and I would like to make window toppers, placemats, casserole carriers, pillows and purses from it. Also from Clover’s Trace ‘n Create – Dresden Collection, making lined scarves, girl’s skirts, window toppers, and pillows would be wonderful. I would make a dresden plate quilt with mens ties that I have collected over the years and now have enough to make my quilt. From the fabric I would probably make the table runner. Love the colors of the fabric.very pretty. I love the table runner! I’d make it and matching placemats. I would love the template to create a wall hanging. I would hang the Dresden wall hanging by my front door. I have been wanting to make one, but felt I couldn’t tackle something so difficult. With the template, things would be so much easier. I would use both in a quilt. Or I would use the fabric for the bag, and use the clover to put a cool design on both sides of the bag! Thanks for the chance to win! I’ve fallen in love with this pattern: I have it bookmarked and a shopping list too!. I came back to this page, and after scrolling all the way down, I see where I might win some of the items on my shopping list! Thanks so much for offering the free pattern. Just to say many thanks for this brilliant tutorial with the excellent photographs. I think we’re all winners here for that. I’d use the fabric to create a set of shopping totes with different bright solid sashing and backing in each one and I’d use the template to create an art deco sunrise from the bottom corner of each one. Planning is fun! I love the grey fabrics with the lime green!! I would love to make a purse for my daughter and would also love to make this table runner, or maybe a bed runner!! The possibilities would be endless with this fabric and the templates! Love the design and thank you so much for the instructions! I am always inspired by your samples! The clover template would have endless possibilities. I am a hopeless bag lady, everyone knows their gift will be in a reusable bag. I can only begin to imagine WHAT the template would add!. Thanks for all you share with us!! I’d like to make a table runner for a friend that I made chair cushions for. I have left over fabric, but she’s never decided on a pattern, and I think this pattern and template would work great. Now if I can just get her to give me the size of her table…. I like the colors. They would go with anything. I might make a bag using the wedges. Or maybe a table runner. I always pair black & white and lime together,. It’s a classic look but also has a modern appeal,. I could use a new table runner,. or tote/bag,. Grey is my favorite for projects like this. I would use different coloured strips for the sashing and make it colorful! I’ve nerer really liked the traditional Dresden layout but this I like! It would be fun to have the yardage and do a contemporary layout for a lap quilt. It would be oh so subtle with those greys – then just one pop of color. The ideas are flowing! Thanks for sharing Nancy! Riley fabric would be mixed with some other Riley fabric I own and go in a quilt, perhaps a YellowBrickRoad pattern or…I’d have to go through my patterns! The dresdan templates are another thing…I’ve got a dresdan quilt in my bucket list, but haven’t dived into getting the templates. I would start by using the Dresden Plate template to make the table runner. I would the go on to use it for quilts and bags and many other lovely, creative things. I would use the fabric to make this table runner. It’s so pretty. Nice table runner! I would love to use this to make some placemats and napkins. Thanks for the chance! I would like to make this table runner for my daughter and son-in-law’s dining room table. Their house has shades of taupe and grey with accents of lime green. I think it would look good in the grey shades that are shown. I would really like to surprise them with this! I have never used the Dresden template and would like to have this experience. I am new to quilting though I have watched Nancy and sewn for many years. I’d love to explore the versatility of the Dresden templates — I could see using the “topsy turvy” pattern for the sides of bags as well as for placemats or runners. I wold love the template because there have been so many easy-for-beginner-patterns with the Dresden pattern. I would use the fat quarter to make the table runner. I am a beginner and that looks like it would be great for a beginner. I would probably make the Dresden table runner with the fat quarter set. I would look great on my dinner table. I am learning to quilt so I would follow your instructions exactly except the color of the binding. Not sure what color I would use but lime is not a favorite. Would love to have the templates to try other patterns with as well! I would use the same Dresden Template from Clover as you did the Runner, they make such Great Products!! Love this Fabric and this Runner, I think I would make the same Runner and since I am new to quilting you have the Perfect instructions right here. I would exchange the Lime Sashing for Teal or White. Thanks for the Chance to Win!! I love thes gray fabrics! They look so modern–something I haven’t seen in gray before. I can imagine so many solid colors with the gray. I would make this table runner with a red solid to go with my dishes. This template is very versatile, but thanks for showing us how to use the Dresden shape in a straight setting, rather than round! The fabric is very neutral so I would add a pop of color like red. I see pillows since the accent color in my living room is red or perhaps a hand bag. I have a trace n create hobo bag template that I am eager to try. I would love to try the Dresden template. Makes it look so easy. I am in need of a tree skirt for Christmas and I think this would make a really cute one. I am desperate need of place mats for a round table this template would work perfectly, with a teal trim. I would love to use the template to make a baby quilt for my new Grandson. Also, it would make beautiful pillows. The knowledge you share is incredible. Thank you! Gray looks fabulous in this runner-especially paired with the lime green. I would first look at the fat quarters, touch them and ogle over them and then try this technique on a tablet cover. I would try a traditional Dresden plate with the templates. I love how you created these templates to speed up the process. This is cool, I have a smaller Dresden, but this would be fund to have the bigger one too. Hope I am not to late. The instructions are so clear. It would be fun to make the table runner using the template for each holiday. LOVE THE TABLE RUNNER PATTERN! I want to make a table runner as a gift for a friend. I’ll have to search for just the right Christmas stash to make the Dresden table runner. You always challenge me, Nancy. Thanks for sharing your talent. I love Dresdens! And I really like what you have done with the table runner. If I were to start now with the templates and fabric, I might have new table runner for the holidays! Thank you, Nancy, for your clear and concise tutorial. I would love to make something with the dresden templates as a wall hanging or runner or ?. Would use the grey fabric with something I have to make something modern . thanks for all your ideas. I have always liked the Dresden pattern and would love to add this template to my collection and make a dresden quilt along with making the table runner. unique and one I would love to make. As soon as I saw this table runner I immediately clicked to read about – I want to make this!! Do it in college colors, add a few clear vinyl pockets, a sleeve at one end, and voila! Great for small office supplies or pictures in a college dorm room. This would be perfect on my dining table. I am in the process of updating & would love to make this runner. Thanks for yet another great tutorial. Love the table runner. So simple but so attractive. Looking forward to making one of these for my daughter. I would like a chance to win to make the table runner or even a wall hanging would be nice. Thanks for sharing and for the opportunity to win. I have recently fallen in love with Dresden Plate everything and would like to start on my Christmas List. For the table runners I want to make for best friends and my daughter I envision using the wonderful Template and fabrics in shades of greens for one friend, Christmas fabrics for my daughter, and a variety of blues for another friend. And oh! yes! for me I have to have all the shades of Autumn. Is there a pattern for this somewhere? Or a way to print this? I would love to have it if so. Love the table runner. With Christmas not to far away I’m starting to get things done know both my daughter and daughter in law would love the table runner I love the gray shades never worked with those colors before. ALSO those templates would be a great help.18 grandchildren to make something for. Love the soft grey colors. Would make a table runner like your sample and also use the templates to make the other table runner that you have pictured. I’m new to the quilting world and you made this project look easy enough for me to tackle. I love the look of the Dresden template used to make wedges. I’m going to be brave a give it a try! With the holidays not so far away. This would be the perfect gift for both my daughter and daughter in law. Having the templates would not only help on the table runner but many more projects. I really do love the fabrics in shades of gray. Love the look of this runner. Would make that my first project. Love the look of Dresden. I would love to use this template & grey fat quarters to make a table runner & maybe a jacket. Love the colors – I would make the table runner for my sister who just remodeled her kitchen and dining room. The colors would enhance the large table in the dining room. Love your unique hints and for a new quilter makes me want to quilt more… Thank you Nancy. I could make a dresser scarf for my friend’s bedroom. She just redecorated in shades of grey. The Dresden plate templates are handy for so many projects! I love the table runner and Dresden placemats would be a lovely complement, as well. Hi I would love to make a few throw pillows with the fabric and the template. It would look great with my black couch. I would make placemats with the template and Riley Blake material using a bright turquoise accent fabric. I would also use some of the fabric in quilts that I make for charities. Thanks for this chance to win quilting supplies. I’d love to use the fabrics to make a table runner with a bright yellow sashing. The templates are so versatile. Making a skirt for my 5-yr. old granddaughter would be fun, too. Oh I have wanted these templetes for awhile! I love the table runner above! One of my daughters loves green, so I would start with making that table runner! Then sky’s the limit! I love this template! I would like to make the table runner and maybe the giant Dresden square quilt. So pretty! I’d use the fat quarters to make this table runner! I love that the lime green adds a great pop to these beautiful grays. I also think that a bright turquoise blue would be a wonderful accent color. Which to choose??? ! I’ve been wanting these templates for a while. I love to make table runners and Topsy Turvy is so different with the sashing in between. I just love it. The grays are so nice. I would love to make a purse with them. Thank you so much. The first thing I would make with the greys is a tote bag. Grey is my favorite neutral for clothes. The templates would offer many options for large and small projects this winter. 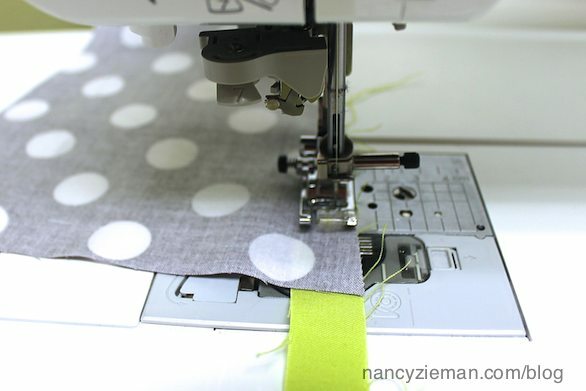 If I were to win I believe I would make a bit larger table runner and add lime green (which I just love for many things especially for purse linings…got this idea from one of Nancy’s TV episodes.) I have also just recently seen some large throw pillows made with a Dresden Plate theme and I would very much love to Dresden Plate templates, which of course, would make the process much easier to do than cutting out templates from quilting plastic. Thanks for the great ideas, Nancy, and the chance to possibly win these. This pattern would be wonderful to give as a gift to mothers with babies. You could use this as a cover for a changing table and roll it right up when you’re done or put it in the car seat as extra padding for baby (or warmth). And being a little-dog foster mother, this would be wonderful for their ‘pad-of-my-very-own’ for lying next to the wood stove on cold nights. Great pattern Nancy. Thanks for sharing it. What a lovely lemon sashing you put on the grey and white, I would put a bright red sash I think for my table. The template set would come in handy for a Dresden plate quilt. I would make place mats and a matching table runner, Would be beautiful for my daughter’s wedding anniversary. What a simple pattern that looks so fun! First, I would untie the ribbon and unwrap each design, then I would unfold each piece and fondle it and hold it to the light and just admire what I had won! Then refold, rewrap, tie and dream about all the projects they would inspire! I would be so excited to win!! I would make a few of these for gifts and different holidays. How perfect are these!! I have weddings this summer! And what great gift for Christmas!! I’m on it! Winning extra fabric would just be LUCKY for me!! But great pattern for gifts! Love it! What a beautiful pattern! And easy too. I would make a table runner (since I’m into table runners right now) and this would go wonderfully on my dining table. Thank you Nancy for the pattern. I would like to make the first table runner with red for the sashing and binding…it would be perfect for my daughter’s decor! That table runner really caught my eye. I would love to try making it with the fat quarters…if I should be privileged to win. I think I would use it to make a quilted runner for the back of my sofa. It would make it look new. I would make the runner trimmed with yellow! I have been looking for a table runner pattern for a friend who is moving into a new home. This runner is perfect, and if I won the template I would make her one, plus many more for friends. Thank you for this opportunity to win! I just received another order of items from Nancy’s notions and the Dresden Template was in that order, but if I win I would give this to my daughter. She is designing some beautiful clothing and maybe will start to quilt. The fabric collection I would use to make a great purse trimmed in red. I would use the fabrics and templates to make quilted tote bags that I use as Christmas and end of school gifts for my granddaughters’ teachers. What a beautiful collection! I love the table runner but I can also see this fabric used to upcycle a thrift store denim jacket. It would also make a lovely handbag. I would like to make the table runner with insulated batting ( like a pot holder) so it could protect my table,plus I could turn it over to iron something in a hurry if I wanted to. Using the Trace ‘n Create Quilt Template—Dresden Collection I would make a bed runner just like the one you made. I think I would use either red or navy as the sashing and binding. Love the modern design. I have some strips of floral fabrics from my MIL’s stash (30′s-40′s) that would make a lovely Dresden table topper for my daughter. I am also fascinated with the many interesting ways you have used the Dresden template. I would make table runner for my son in California who has these modern colors in his home. His new table is dark and these colors would be nice contrast. I think I would use the bundle to make chevron modern Dresden lap quilt. Thanks for the giveaway! I would make a bed runner from the Riley Blake fabrics. I would use the templates to make this table runner along with many other items. I need a wedding present and this runner will fill the bill. I would add an aqua accent and white background fabric to that beautiful collection and make a modern throw or wall hanging. Really like the wedge template, would make runner and placemats. Also quilt using half circle from earlier runner. Your show and blogs are great, I always learn something to incorporate into my projects. Thank you Nancy. Love the Riley Blake fabric, I would make a purse for myself highlighted with bright pink. I have always wanted to make a dresden table topper, I have seen so many varieties but do not have the tool to start. I would love to win either the fabric or the dredsen tool. Thanks Nancy. With the Dresden template I’d try the table runner. I’d probably make a small quilt. I would love to make the very table runner you made. I have a thing for table runners and I love this pattern and the fabric choice. Thanks for the opportunity. I love the grey color. I would use a bright red for the sashes. I was also thinking instead of the sashing you could the flat lock stitch from my serger to put them together. The sashes would look pretty with decorative thread. I love the templates. They would be great in making different pillows for my couch or even the back of a coat. It would be be fun in felted wool. I would use the template and fabric squares to make tote bags that I make at Christmas and the end of school for gifts for my grandaughters teachers. Thanks for the great ideas and information on your site. I would start with the template to make the topsy turvy table runner. I would love he templates. Possibilities are endless. Maybe a tree skirt or tote. Keeping my fingers crossed. I would make a table runner with th fabric. Highlighted with yellow to match my kitchen. Keeping my fingers crossed. with the Trace ‘n Create Quilt Template—Dresden Collection I would try to find out what I could make besides quilts with it. I could experient with it for new things to make. The grey color pack will be wonderful to use with the dresden template pack to make new things. I will make things for the senior citizens around my neighbor hood that need a lift. AS well as friends that are down to cheer them up or if they are ill! I love to put small things in cards to surprise them. I send things to my granddaughters to keep in touch with them and I can use it to make them. I love your Dresden pattern. I can think of so many things I would like to make with this set! Out of the fat quarters I would like to make a hobo bag. I would add some pink to it. I love the pink and grey combinations. I would like to make a Dresden tree skirt out of the trace n cut. The basic grey fat quarters would make some pretty placemats and also totes. So many uses for this fabric. Hope I will be the lucky winner. All the templates in the Trace and Create collection are great for the novice sewer and the California Collection are especially interesting to me as I always have had trouble sewing bags and these templates may be the help I need. Also the dresden plate template I know I would make the table runner as well as a small quilt. So many good things to make with these templates. I have always wanted to make something Dresden plate. Using your templates would help me make this wonderful table runner. I would be learning something new and make my first project making a Dresden plate. Thanks for the chance to win ! I am always impressed with Nancy’s and her staff projects, color selections, and patterns. That’s why I watch Nancy’s programs, pour over her catalogs and website, and purchase her products. She has a wonderful business that is very professional and courteous. I really like this use of the Dresden plate design. I would make a table runner for my son and his family. They have modern colors and designs in their house, so I know that they would appreciate this fabric collection. I have always wanted to make something Dresden. This table runner would be a great project to learn how to use your templates and make my first Dresden plate project. Thanks for the chance to learn something new and exciting ! I have a completed table runner on my sewing table right now waiting to be a wedding gift next weekend. I used purple and blue batiks with black sashing. It turned out lovely even if I say so myself. I used the dresdin template and thought I was being so creative. Ha. I look forward to making this same runner and also I’d like to enlarge it and create a lap siz quil for my living room. Great for Christmas gifts also. Love it! Thank you for this oppertunity. I would like to make the table runner for our daughters who have large enough tables, and also endeavor to make a table topper with the Dresden collection for my table. Thanks for sharing. fun runner, looks a lot like the wedge Go! die, gave me ideas! Of course I’d make a quilt out of the FQ bundle maybe a baby one with a pop of pink or blue? The long table runner shown above wouldn’t work too well with my 35 inch round table, so I’d probably use the Riley Blake basic gray variety pack interspersed with some Kona solids in coordinating colors to make a table topper to fit my dining table. My husband and I both favor blues and greens in the teal range, so those would undoubtedly be featured. I love your table runner! I could make so many things with the templates, but first, I would make this table runner. It is so versatile, you can make a runner for every holiday and/or season. Can you tell that I am on a table runner kick?? I would also use the templates to make a quilt for my soon to be grandchild; just have to wait to see if it’s a boy or a girl. That should keep me busy for quite a while. Thanks for the opportunity to enter this great give-away! Using this fabric, I’ll add teal and black so my son’s favorite hues (from his hockey team) will be together in a fun quilt. Using the template, I’ll lengthen your runner and make additionals with wider sashing between so I’ll have a full-size quilt. I am a fabric-aholic. I do a lot of applique and these fabrics would be perfect. I also am a Nancy Zieman fan. I watch your shows and use your products. I like to try new things. I could use the templates to make gifts for all the holidays and church sales. I would love to have that template and the fabric!! The combination of the colors and designs is awesome! We are moving to a new house and our little dinning area is right off the entry…I have been looking for a table runner for the area and I think this is the ticket!! Thanks for the opportunity and the great idea! Keeping my fingers crossed! I could make so many things with the template, from fat quarters, table runner, Christmas Tree skirt & a Modern Dresden Quilt, I could also make a round Dresden table runner, Placemats. Thank you for giving me a chance to win.